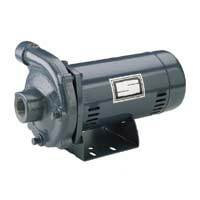 Catalog # J218-582APKG, Jet Pump Motor only, 1/3 Horsepower, 115/230 Volts, 1 Phase, Square flange (1-phase), ODP (Open Drip Proof) Replacement Motor only - no pump. Features • High Head and Medium Head Models Heavyduty motors, easy service design and fourposition discharge. • Easy Serviceability All models include replaceable wear ring and feature back pullout design. • Drain Port Provides for easy winterizing • Body and Seal Plate Close grained cast iron. Applications • Water systems and sprinkling for homes, farms and industry.